Ten months, 5000nm, 18 countries, 80 harbors. One broken collar bone, clogged head and seized up water pump. Hundreds of cruising friends met. Below are some more data and figures of our extended cruise. As I write this post, we are overlooking the Boston skyline from a favorite anchoring spot, Peddocks Island, part of Boston Harbor Island National Park. 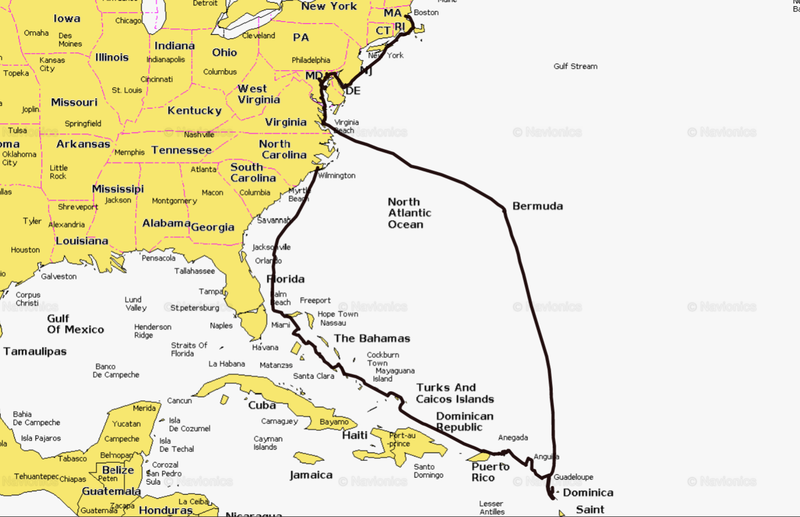 We will sail the short hop to Constitution Marina tomorrow which was our departure point ten glorious months ago. This trip as been an unbelievable adventure in so many ways. Below are some of the analytic aspects of our voyage. Argon's grand loop: 5000nm (5754 statute miles), 15 countries, approximately 80 harbors. Boston skyline from the anchorage at Peddocks Island last night. A fitting time to reflect as we return to our starting point. Many Wonder, Few Ask: How much does a trip like this cost? 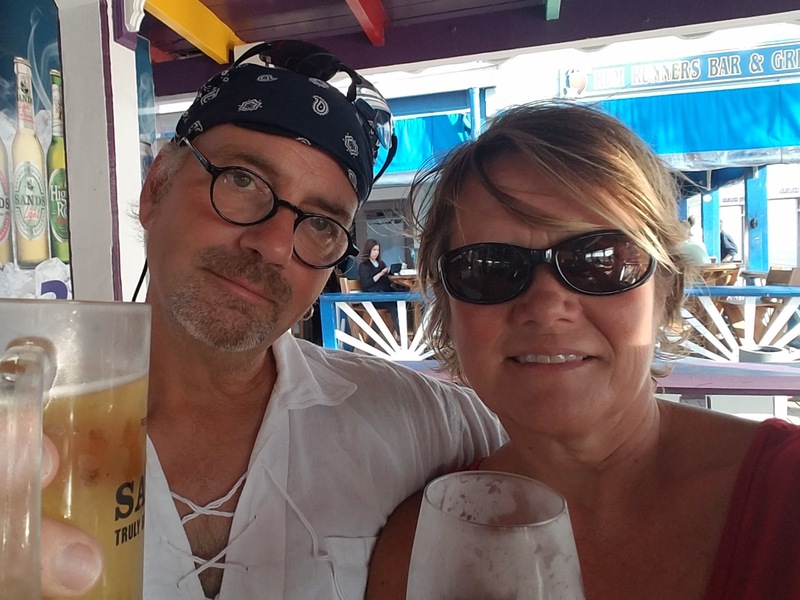 There is a range of how to approach an extended cruise from a lifestyle and thus financial perspective and scant specific information out there. During our planning phase I would read Beth Leonard's The Voyagers Handbook in the evenings (while sprawling on my king sized bed... oooohh, to sleep on a big bed again; I digress). Beth's book is a wonderful resource for learning about passage planning, watch keeping, anchoring, sail handling, living aboard, etc. A particularly interesting section is devoted to finances and is highly recommended for anyone considering an extended cruise. 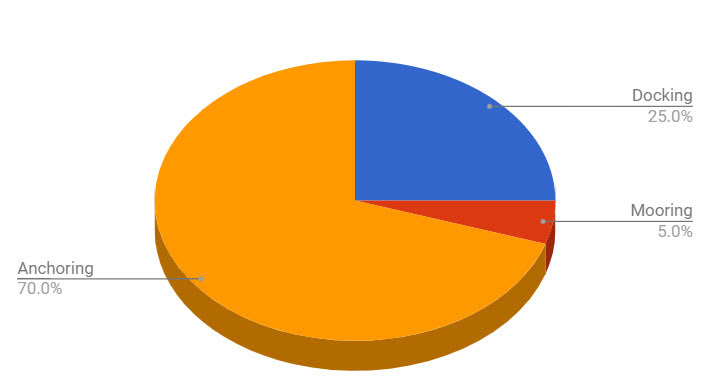 Below is an estimation of our monthly and total spend. Disclaimer: We started off with an extremely ready, sea worthy vessels (and lots of up front investment in to it). Many cruisers we met along the way had older vessels and needed to spend more time and money fixing things along the way. Data / connectivity. 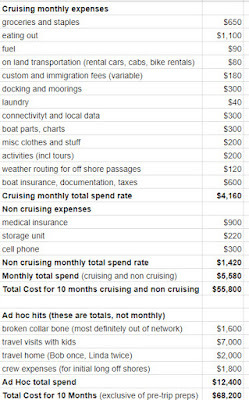 See blog post Data While Cruising Note: Our (aka Bob's) need for data due to his job is definitely way more than that of the average cruiser. And we have accumulated half a terabyte of photos and videos to upload. Eating out. One can certainly spend less by cooking aboard vs eating out as much as we did. But we enjoy experiencing the islands by visiting lots of different restaurants and eateries. Trips. The visits with the boys were fantastic and I am very grateful for the special time with them in gorgeous locations. In hindsight, we would have chosen less expensive locales. Two of the three countries we selected for visits were extremely expensive: Bermuda and Turks & Caicos. Docking more than planned (vs. anchoring which is free). 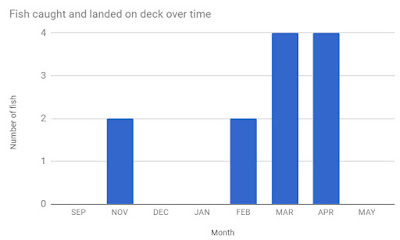 Dock fees would vary widely from $40 to $160 per night. (The lower priced docks were only basic tie ups with no electricity or water.) Sometimes we docked to be more secure in high winds, or to be able to get shore power to run the air conditioner a bit (to dry out the boat even more so than to cool it), and to give Argon an occasional good exterior washing. We extended dock time in St. Maarten to give Bob's collar bone some time to heal and in TCI due to bad weather and waiting for boat parts. Boat insurance - Many cruisers deem this optional or too expensive and opt out. Some marinas require insurance for dockage. I suspect shipyards will also require if a haul out is needed. Our insurance premium was quite high due to our scant off shore experience prior to the trip and the associated dangers with the long off shore passages (and shorthanded crew). In the future, our premiums should be less as our experience is now much more robust. Medical insurance - Many cruisers are a bit older than we are and seem to have medical insurance either through their retirement package and/or Medicare (if US) or national insurance, of course, if from outside the US. We both purchased private, basic policies through the healthcare exchange last year and planned to mostly pay out of pocket for minor needs. Bob continued working remotely throughout the trip, more than planned at about 20-30 hours per week which was good to help address the ad hoc hits and lessen the savings drain. YouTube sailing channel and ad revenue from blog: Well, we are not popular enough to make more than a couple of dollars a month here... yet. Bob continued his software engineering on the high seas and anchored in harbors. The work sometimes took him away from land exploration but provided nice income to off set expenses. I immensely enjoyed the freedom from paid work for a while (although the paycheck is missed). Although $68K sounds like a lot, this was our total expenditure for 10 months of living. Intense living filled with unique adventure, travel, challenge and beauty. It was worth every penny. There are a few reasons why most long distance cruisers are in sailboats, not power boats: (1) sea steadiness / handling in big waters, (2) cost of fuel, and (3) travel distance with available fuel. We strive to sail as much as possible but firing up the diesel is necessary when winds have died as well as for motoring in to and out of harbors. In addition, the alternator on the diesel engine will charge our batteries when the solar panels can not keep up such as when we were in higher latitudes (last fall) and when there were extended periods of overcast. We consumed 270 gallons of diesel overall. 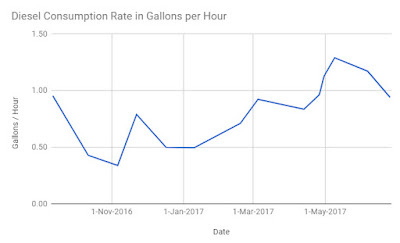 The fuel consumption rate is generally about 0.8-0.9 gal/hour when we are motoring in to and out of harbors and in transit due to low wind. 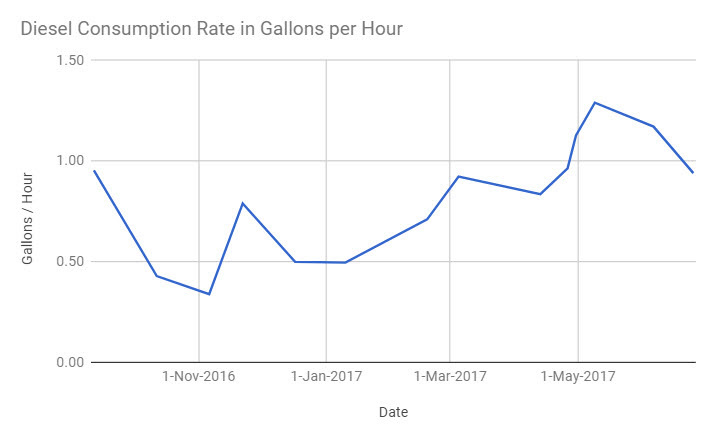 The rate was lower around November when we were in Bermuda and having to run the engine a bit just to charge the batteries as the low, late season sun was not quite sufficient for our solar panels. At 0.8 gal/hour we can run the diesel for 96 hours. Depending on conditions, this would yield a range of about 675nm. This is important to know for the extended off shore trips should the need arise to motor substantially. 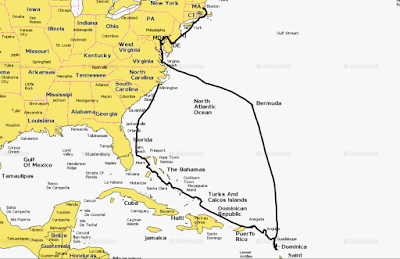 Our most efficient trip may have been from Hampton, VA to Bermuda 650nm (748miles) using only about 0.6 gallons diesel which translates to 2,247 miles/gal (I'm feeling very green). However, total gallons consumed these past ten months were 270 which for a 5000nm (5753mile) trip translates to 21 miles/gallon. Diesel price ranged from a high of $7.91/gal in Antigua to lows around $2.60 in North Carolina. Our total spend was about $850 on diesel and about $50 on gasoline for the dinghy. Other than renting a car a few times, we had no automobile expenses this past year. As friends have commented, Bob and I most definitely find our chi best when sailing. However, there have been a few times during this trip when we butted heads and both wanted nothing more than to get away from each other. Two of these times we were kind of stuck on the boat and I was unable to easily stomp off and away. Argon feels very tiny at times. Our early fishing success was attributed to Smitty, our third crew person for the six day Bermuda to Antigua passage. This would be followed by a couple of months of being skunked before starting to get hits and bring in fish starting around the waters of Puerto Rico, Turks and Caicos and throughout the Bahamas. The graph below represents mahi, wahoo and barracuda that we landed on the boat (but did not necessarily keep and clean). There were several additional mahi that we came close to landing but lost. It is customary not to eat barracuda in particular as they can be infected with ciguatera so we carefully plied out the lure and threw these mean guys back. Fishing success kicked in around February. Mahi mahi caught in Bahamian waters. 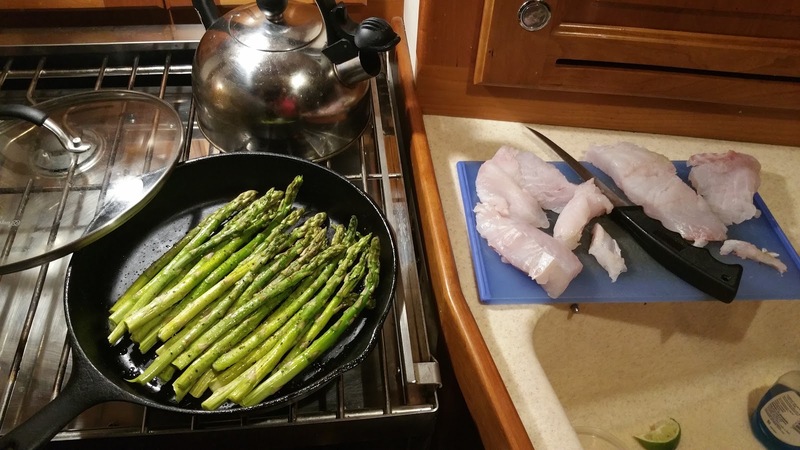 We stretched fresh mahi for several days across many meals. Yum! We switched to using a hand reel instead of a traditional poles in the Bahamas. We lived by a multi tab spreadsheet the 18 or so months prior to our trip to help us organize the many things to do, to buy and to learn. Now we have started a new log of projects to tackle this winter complete with cost estimates, due dates, and completion statuses. Below are a few items on the list. Upgrades: Reacher fairlead car adjusters, rope clutch replacement (started recently in Mystic), add solar panel (Solbian 50W) and controller - this will increase our (theoretical) power generation from 335 to 385, solar panel controller upgrade, DC to DC converter, aft cabin shelves, nav station instrument, top down furler for spinnaker (not sure), ground tackle (increase from 100 to 150 feet of chain), compass light re-wiring to separate breaker, etc. Maintenance and replacements: Sails (main, jib, genoa) washed, inspected and repaired; Canvas cleaned and treated, new sail cover, brightwork (teak cap rails, cockpit table, dorade box covers, etc), interior floor varnishing, dinghy outboard servicing, dinghy cleaning and proactive patching, kitchen faucet (done), head hoses (yuk), move stern light, goose neck inspection and new bolts, etc. But wait, it's still only early July! We have the rest of the summer to spend enjoying the cold (but warming) New England waters. So not to much attention to this spreadsheet just yet! Argon returning to Mass Bay via the familiar Cape Cod Canal. Welcome home - Ronit and I must have passed you yesterday. We were returning from two weeks at the Vineyard, Newport and Buzzards Bay, motoring back from an overnight @Plymouth. Arrived Constitution 11am (just before the rain). Hi Colin - We were just in Newport, too, from about 23 June - 5 July. I suspect our paths crossed unknowingly. We also anchored outside Plymouth Harbor the night of July 5. We will sail to CM later this morning and will be there all week before moving on to the north shore. Hope we can catch up a bit! Great info and stats, glad you guys made it!! Welcome Home!! Thank you, Dave. Hope you and Laurie are well! Welcome home! Great blog post. I really enjoyed following you along your voyage, congrats on a safe and memorable journey. Thank you, Tom. It's good to be back but we do miss the Caribbean waters! So fun to read and watch your videos! Welcome back - hope to see you here! Hi Bill - Looking forward to visiting with you and Cathy. Hello Bob and Linda, Glad you've made it back safely and what an adventure! We love the stats you've provided. S/V Sea Yawl is visiting Boston this week along our own journey and have decided to head South again in the coming months. and Itsy says hello too!